Most of my life I was taught that God hates sin, which translated in my mind to me becoming the object of that hate when I sinned and concluding that God was mad at me as long as I had sin in my life that I had not asked for forgiveness for. As a pastor, I have heard many say that this is how they too have processed God, believing that God is angry with them and often times that they are being punished by God because of unresolved sin in their lives. But the more I have studied the subjects of Love and Grace from a biblical perspective my question has shifted to, “What if God hates sin because it hurts us and not Him?”. What if we still reap what we sow and the seed of sin still produces harvests in our lives that are not His desires for His children? What if He knows the results produced from actions we have chosen that are outside of His will for our lives and He is more grieved than anyone by the pain that the harvest of that seed will produce in our lives? What if doing things God’s way still produces life and peace but the wages of sin is still destruction…and by doing things outside of God’s way the results are “the destruction of a marriage”, “the destruction of our health”, “the destruction of our families and relationships”, “the destruction of our happiness”, “the destruction of our peace”, “the destruction of our progress”… ? What if many times what we assumed was God’s punishment for an action(s) was actually just the fruit of that seed we ourselves planted…? I just wonder if it’s possible that God actually does love us more than we can imagine and we’ve been seeing our circumstances through the wrong lenses. What if God is at least as loving and as good of a Father to me as I would be when it comes to my own children…? What if everything we have been taught about God being vengeful, vindictive and abusive was actually just the perception of vengeful, vindictive and abusive leaders somewhere down the line who painted God in their own image as a method of control and manipulation…? 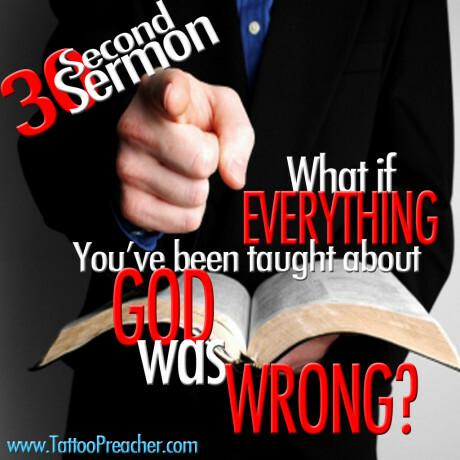 What if everything you have been taught about God was wrong…? My new book Quantum Christianity: Believe Again ~ Discovering the Science of Scripture. Uncovering the Mysteries of Faith ~ addressing subjects like this one and many more is slated for release on May 8th, 2015. WOW…I was really moved by your 30 second sermon and I feel an anointing over you. I believe you are going to reach a lot of people. I can’t wait to read your book and of course I want you to sign it. So excited for you Aaron.